According to the Chiang Mai City News (https://www.chiangmaicitynews.com/news.php?id=4387), the Junta has announced that it plans on enforcing the Alcohol Beverage Control Act of 2008 in order to reduce the cost of alcohol related deaths and alcohol related social problems in Thailand. If the rules are implemented and enforced, they will have a negative effect on a large section of restaurant and hospitality industry in Thailand. Specific rules pertaining to the sale of alcoholic beverages makes it difficult to sell alcohol. Alcohol cannot be sold or consumed in any public place, place of worship, school, health care facility, petro station, or other places designated by the government. No selling or dispersing of alcohol by promoting it (recommending alcohol), providing discounts (no more happy hour), displaying images or logos of alcohol in any language (including banners or posters), or by lucky draws, rewards, free drinks. Old Bottles of wine or beer cannot be used to decorate a business, photos specific brands of alcohol in menus have to be blurred out, no word of mouth promotions allowed, and servers are not allowed to make recommendations. The ripple effect will also be felt throughout the Thai community. Under the Alcohol Beverage Control Act, no person shall advertise or display, directly or indirectly, name or trademark of alcoholic beverage in a manner that may induce a person to drink. Advertisements by alcohol beverage manufacturers shall not display any alcoholic beverage in its advertisement or packaging. 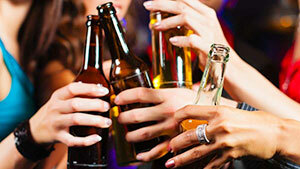 The restrictions on promotion will essentially prohibit or strictly limit advertising of alcohol beverages in Thailand. Advertising from alcoholic beverage companies helps underwrite the costs of print media, television, film, sports programs, radio, internet media, and concerts in Thailand. These community supported activities will face a major loss of funding. Foreign Expats living in Thailand bemoan the loss of the Thai beer girls, restaurant service, and selection of beverages. Business owners fear the loss of revenue and the ability to maintain their operations. The Thai public face the loss of their favorite television program, concerts, and sports teams. However the Junta sees alcoholism as a cancer on Thai society. Thailand is the top alcohol consuming country in ASEAN (per capita). The Junta reasoned that the economic losses that results from a strict interpretation of the Alcohol Beverage Control Act of 2008 is countered by the effects of alcohol abuse on society. The Junta sees reducing alcohol consumption in Thailand as a way to stop the growing alcohol related problems in Thailand such as crime, violence, family instability, and lost productivity.